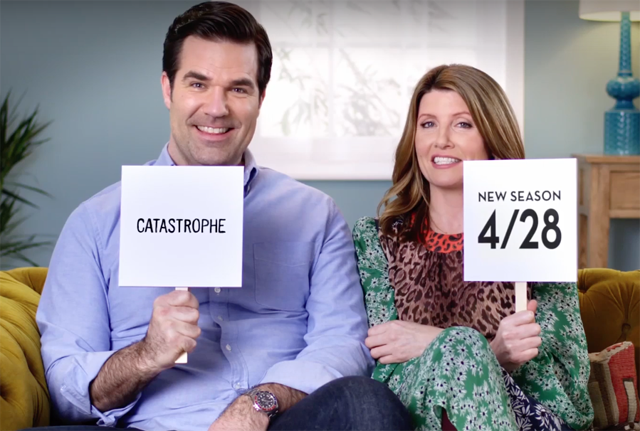 Amazon has revealed the teaser for Catastrophe Season 3, which you can watch below. The new season of the critically-acclaimed comedy series is set to premiere on Premieres April 28 exclusively on Amazon Prime Video. Written by and starring Rob Delaney (Life After Beth) and Sharon Horgan (“Pulling”), Catastrophe, produced by Avalon Television, with co-producers Birdbath Productions and Merman, is a comedy following an Irish woman and an American man who, after making a bloody mess as they struggled to fall in love in London, have embarked on a series of best-attempts to clear it up and generally do the right thing. The already-greenlit Catastrophe Season 4 is scheduled to premiere exclusively on Amazon Prime Video in the US in 2018. The entire first and second seasons of Catastrophe are now available on Prime Video. In the second season of the show, the stakes are higher as we rejoin the now married Sharon and Rob who are struggling to stay in love–and lust–while taking their trademark mayhem into parenthood. A monstrous family (Carrie Fisher, Star Wars) and crazy friends (Ashley Jensen, “Ugly Betty”), also seem hell-bent on ensuring that whatever new life-journey Rob and Sharon embark on will be anything but simple. With times having changed for our turbulent lovers, and with their new arrival back home; at the start of the season we rejoin the chaos as they decide on an ill-considered party to get the introductions complete in one hit. Unfortunately for Sharon, the gathering coincides with a visit from Rob’s eBay obsessed (and “card-carrying sadist”) mom, a disturbing revelation about her father’s health and an unfortunate incident with the family dog. Catastrophe is executive produced by Richard Allen-Turner (“Workaholics”), Kara Baker (“Jen”), Delaney, Horgan, and Jon Thoday (“Last Week Tonight with John Oliver,” “Workaholics”).